We’d love your help. 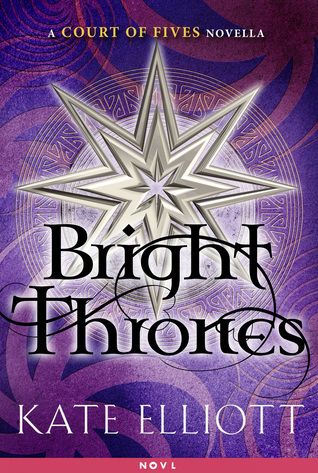 Let us know what’s wrong with this preview of Bright Thrones by Kate Elliott. Bettany has always been an outsider in her family: the angry one, the wild one, the daughter who refused to accept the dominance of her Patron father’s people over her Commoner mother’s. When her From World Fantasy Award finalist Kate Elliott comes a thrilling companion novella that links Poisoned Blade and Buried Heart, the finale of the enthralling Court of Fives series. Bettany has always been an outsider in her family: the angry one, the wild one, the daughter who refused to accept the dominance of her Patron father’s people over her Commoner mother’s. When her family is torn apart by a vengeful lord, Bettany makes a dangerous choice to accompany their household servants being transported to the mines, hoping she can keep them from suffering a fate worse than death. Their only chance lies with a stuffy foreign doctor who may be able to help them escape, but can Bettany trust him? Her instincts tell her there is much more to this man than meets the eye. To ask other readers questions about Bright Thrones, please sign up. A very good novella that provides some of the missing story of what happened to Bettany after she was separated from her family. Also, it gives much more insight into the whole relationship between her and Lord Agalar. Definitely worth reading. A series novella that manages to utterly transform the events of the previous novel. Can't wait to see how this all ties together. It's nice to have a little more light shed on Bettany's actions. She's a really fun character, resourceful and clever. But the romantic subplot, eh. I liked Bettany more than I like Jess. I liked the anger, although I have to say "rash and angry" is a look I've seen in so many of Elliott's protagonists I'm sort of more interested in seeing "wise and slow and secretly angry" for a change. I don't think the romantic subplot was necessary or worked well - it felt obligatory and caused by the source material and generic rather than organic. I really disliked the distribution of information. The parts that are withheld and given. The connection bet I liked Bettany more than I like Jess. I really disliked the distribution of information. The parts that are withheld and given. The connection between the main trilogy and this novella. And last but not least, (view spoiler)[it feels like the only reasons Agalar keeps misgendering his trans brother is so that a) his transness can be another REVEAL! and b) to emphasise it and make it a thing (if we knew he's a brother all along would Bettany realise that Soras is trans? ), and it felt cheap. I mean, I get it. An author wants to write a trans character. But does the transness have to be a REVEAL? Can't it be written in another way? And if it needs to be signalled and acknowledged, are there no better ways to signal it? During the main three books in the Court of Fives series, we aren’t told all that much about Jessamy’s twin other than the fact that she contrasts greatly with them all. This novella helps readers see who Bettany is as a person, and why she decided to leave her family behind. In Bright Thrones, Bettany is able to find a place in the world and a somewhat unsure yet promising direction in life. Overall, I wasn't wowed by this novella. It filled in some backstory for Poisoned Blade, especially regarding Lord Agalar and Bettany and what was going on with them, but I was left wanting a bit more. With Night Flower, the other novella, I was enraptured, enchanted, and I felt that their (Jes and Bett) parents' love story was expressed in such an admirable, endearing, and fulfi In Bright Thrones, Bettany is able to find a place in the world and a somewhat unsure yet promising direction in life. Overall, I wasn't wowed by this novella. It filled in some backstory for Poisoned Blade, especially regarding Lord Agalar and Bettany and what was going on with them, but I was left wanting a bit more. With Night Flower, the other novella, I was enraptured, enchanted, and I felt that their (Jes and Bett) parents' love story was expressed in such an admirable, endearing, and fulfilling manner. I think this novella tried to do something similar for Bett while giving glances into other story happenings behind the scenes in Poisoned Blade, but I didn't feel the same connection. I do recognize, however, that I haven't been fond of Bett in the series thus far. I can understand where she comes from, I can understand her logic, but I can't get behind her for some reason. I need to think a bit more on why, because I'm not sure I can pinpoint an answer at this time. Also, Night Flower had been a refreshing perspective on a story that had only been hinted at in the series, whereas Bright Thrones pretty much recaps known plot and lacked the element of the unknown. I think that was a big influence to my feels. The story of Bettany and what happened to her after her family's fall from grace and then after she runs into her twin, Jessamy. Bettany was taken to the mines but managed to show that she could be more useful to Lord Agular as a scribe and assistant but she also realizes that he is not exactly what he appears to be either and that maybe they can help each other. It was interesting to see more of what happened with Bettany since she was the only sister who was separ Review first posted on My Blog. Bright Thrones is especially nice because it fills in what happened to Jessamy's twin sister Bettany after the bad guys (as it were) came for Jessamy's mother & sisters and Bettany had been ordered by their mother to go with the former servants to the mines, to do whatever she could to make their lot easier. When Bettany got and the others arrived at the mines, she met a doctor and her life changed. The last time Bettany's & Jessamy's paths crossed, each thought that they were in a positio Bright Thrones is especially nice because it fills in what happened to Jessamy's twin sister Bettany after the bad guys (as it were) came for Jessamy's mother & sisters and Bettany had been ordered by their mother to go with the former servants to the mines, to do whatever she could to make their lot easier. The last time Bettany's & Jessamy's paths crossed, each thought that they were in a position to rescue one another. Unfortunately, neither had any way to see the hoped-for solution from the other's point of view. So rather than having to think that Bettany had betrayed her family, I really appreciated finding out her story. Both this novella and the other one (Night Flower, which told the story of how Jessamy's parents met & fell in love) really add a lot to the Court of Fives trilogy. I definitely recommend them both for anyone who enjoyed the Court of Fives trilogy. Oh, Bettany. Such righteous anger! I am glad that she was not the heroine of the whole series because I find her a little tiresome, although she does salvage herself by trying hard and having high standards for herself as well as for others. I wished I understood the doctor's character better. He was not as well developed. Indeed, I think that all the characters in this novella were not as well developed as the ones in the main three Court of Fives books. I give Elliott props for having a trans Oh, Bettany. Such righteous anger! I am glad that she was not the heroine of the whole series because I find her a little tiresome, although she does salvage herself by trying hard and having high standards for herself as well as for others. I wished I understood the doctor's character better. He was not as well developed. Indeed, I think that all the characters in this novella were not as well developed as the ones in the main three Court of Fives books. I give Elliott props for having a trans character and for having a family that includes adoption outside of ethnic divisions. There wasn't enough time to develop these interesting themes but I thought she related them well. This is a nice little novella that looks at the events of the 2nd novel from Bettany's point of view. It doesn't really add a new layer to anything or make me think about the characters any differently. But it was a nice little footnote filling in a few details in the overall story and some character motivations. I like the new trend several authors have adopted with releasing short stories like this more frequently that fill in gaps in their larger stories. Brian McClellan is someone who does th This is a nice little novella that looks at the events of the 2nd novel from Bettany's point of view. It doesn't really add a new layer to anything or make me think about the characters any differently. But it was a nice little footnote filling in a few details in the overall story and some character motivations. This is an ebook that sits around the events of Poisoned Blade, telling some of what happened to Bethany. It does stand alone but it really helps if you have read at least the first book in the series. I was a little dubious as I hadn't been wild about Night Flower, the previous e novella, much as I love Kate's work. However this one was much more to my taste, probably because I didn't already know how events would pan out for Bethany. In fact I want more Bethany please when the main story is don This is an ebook that sits around the events of Poisoned Blade, telling some of what happened to Bethany. It does stand alone but it really helps if you have read at least the first book in the series. I was a little dubious as I hadn't been wild about Night Flower, the previous e novella, much as I love Kate's work. However this one was much more to my taste, probably because I didn't already know how events would pan out for Bethany. In fact I want more Bethany please when the main story is done. This novella follows Bettany as she is taken from her house and sent to slave camps at the mines to work herself to death. She's saved from that fate by her wits and the kindness of Lord Agalar, a traveling, world-renowned doctor, doing research at the mine. Bettany learns to overcome her anger and channel it into helping others and finding peace. She still doesn't understand her twin, nor does her twin understand her, but she is able to find peace with what has happened to her family. Could have been named "Spoiled Brat gets her Comeuppance"
She is a spoiled brat who hates everything about the world she was raised in and becomes angry with anyone who has the audacity to try to find happiness or joy in that world. Putting her in a completely different world was the only way to get her to do anything but sit in a room yelling about how much the world has wronged her. I still don't like her but I do think better of him. A great look deeper into Bettany's character! I really enjoyed this novella - a good way of gearing myself up to read the final novel in the trilogy. Elliott manages to be nuanced even in this shorter length, and it was especially great to get a different perspective on things from someone who isn't Jes. This review has been hidden because it contains spoilers. To view it, click here. Better written than the last novel, but also substantially more dull. I didn't feel that finding out Dr. Aglar is also a captive of sorts, and not a Saroese lord added that much to the series. It would almost be more interesting if he had been what he'd appeared to be. Oh, it's good to see why (THE HELL) Bettany is who she is, and how certain things in Poisoned Blade came about. I'm still pretty mad at her! But thank you, Kate Elliott, for the filling in. Can't wait for the final book! Books like this one allow readers to have a bit more character with a character. It provides a better understanding of who a certain person is and how they got to where they are in the actual book series. I'm liking Lord Agalar more now that I have this little insight. A bit misleading to call this 2.5 since it occurs during the events of book #2. It fills out Bettany some more, although I still don't feel like I know her. It was good to get Bettany's side of her story. This is an exciting, romantic novella I wish I'd found sooner, and definitely worth your time to read. A good novella on what happens to Bettany after Poisoned Blade. A quick, little peek into Bettany's mind. Enjoyable, although not necessary for the series. So glad I read. It's so satisfying to know why Bett chose as she did! Loved it, another wonderful addition to the series! I love novellas! They are great fillers for certain characters or storylines that just won't get the closure they deserve in a series. Bright Thrones does just that with Bettany, Jes' sister. I'm glad to say that I have become a huge fan of hers. Glad to get her POV. Super pumped for the finale of this series now! !